This super-cute hatinator will shimmer in the sunlight , and is a fabulous piece for a wedding or the races. 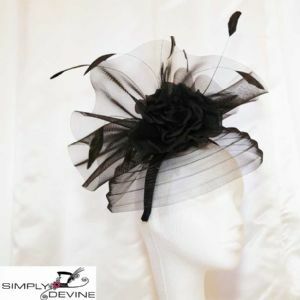 Trimmed with two sets of feathers and topped off with a beautiful silk flower it is a versatile hatinator for any lady who wants to be noticed, but doesn't want to wear a huge hat. It sits comfortably on a silk band for easy-wear.